A fully featured, crazy-light space for 2 fast-moving travellers. Steep walls create lots of head room to comfortably accommodates 2 people. Hubbed poles and canopy clips are super-fast to set up and create lots of interior volume. 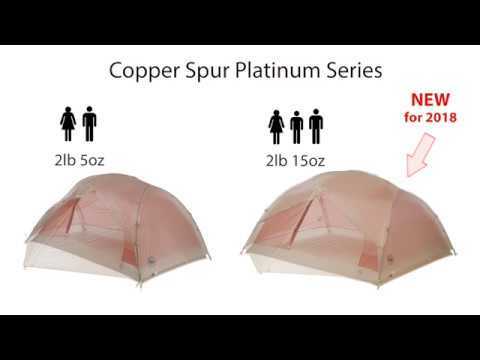 The platinum version of the Copper Spur Tent has fewer features, less pockets, no vents, no fuss. Just a basic lightweight tent that actually has interior room to spend time inside during wet weather or to sprawl out while you sleep. Ultralight nylon and polyester mesh canopy balances weather protection and ventilation. High volume hubbed pole structure creates near vertical side walls for more interior volume. Featherlight DAC poles have pressfit connectors and a high strength-to-weight ratio. 4 interior mesh pockets for organizing gear. Vestibules provide gear storage and weather-proof areas to put your boots on. Storm flaps on the vestibules keep drips out of the tent. Includes 8 superlight aluminum J stakes. Compatible with Big Agnes Triangle, Trapezoid and Small Wall Gear Lofts (available separately).